Contains nutrients to support immune function to increase resistance to disease and infections. 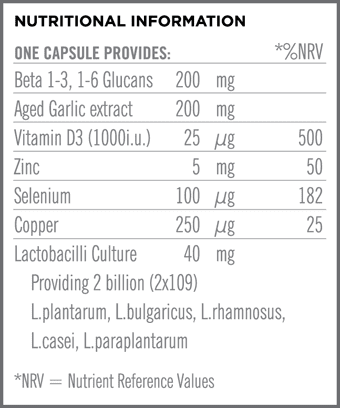 A unique potent immune supporting complex of beta glucans (beta 1-3, 1-6 glucan), aged garlic extract, lactobacilli bacteria, vitamin D, selenium, zinc and copper. Designed to support immune system function for everyday wellbeing and increase the body’s resistance to stress and to help increase resistance to disease and infections. Each ingredient has been carefully chosen for its positive action on immune cells. Beta glucans enhance immune function and reduce susceptibility to pathogenic organisms. Aged garlic enhances various immune factors and vitamin D, selenium, zinc and copper have immune modulatory properties. Lastly probiotic bacteria stimulate and regulate immune response. One to two capsules daily, with or after a meal. Swallow with water. Beta 1-3, 1-6 glucans (from yeast cell wall concentrate), aged garlic extract, mineral amino acid blend (providing zinc oxide, sodium selenite and copper sulphate pentahydrate complexed with citric acid, glycine, hydrolysed rice protein), lactobacilli culture, bulking agent: microcrystalline cellulose, vitamin D3 (with arabic gum, antioxidant d-α-tocopherol, tri-calcium phosphate), magnesium stearate, capsule shell (hydroxypropylmethylcellulose, gelling agent: gellan gum).